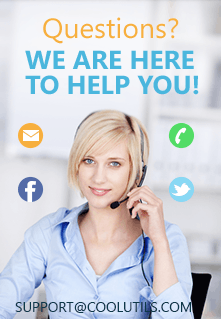 If you receive faxes on a regular basis you most probably face the problem of blank pages. Sometimes you receive a fax with blank pages. That's the sender's fault (i.e. he may have inserted the document upside down). To fix that you ask the sender to resend the document again. But more often you receive normal faxes with info but 1 or 2 pages are blank. For example, the last page of a monthly statement is often blank. All those blank pages in hundreds of faxes take too much space to be stored. Besides, if you later want to split multipage tiff or pdf fax blank pages will add disorder in the final count of pages. So it's better to delete blank pages before you save the fax. Doing that manually will take all your working time. Tiff Pdf Cleaner will do the work for you. You set the files to be checked - Tiff Pdf Cleaner deletes blank pages from them. If you have hundreds of folders with old faxes Tiff Pdf Cleaner is the best solution. It will process all folders recursively and in few minutes you get the same folders with faxes but without blank pages. 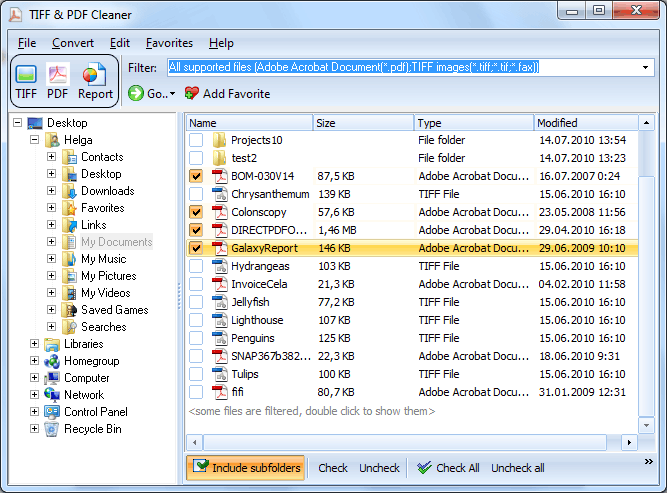 What's important Tiff Pdf Cleaner is very flexible. Most blank page removers detect blank pages if there is no text on them. But such blank page separation leads to keeping blank pages that have no actual info but have a header or footer. Tiff Pdf Cleaner has improved algorithm. You set the workspace to analyze and the program detects blank pages based on your instructions. For example, it will delete pages as blank only if the bottom area is blank. It's very convenient and gives you full control over the process. So to solve the problem of blank pages in faxes download Tiff Pdf Cleaner now for free and try it out for 30 days with no obligation. Safe choice! 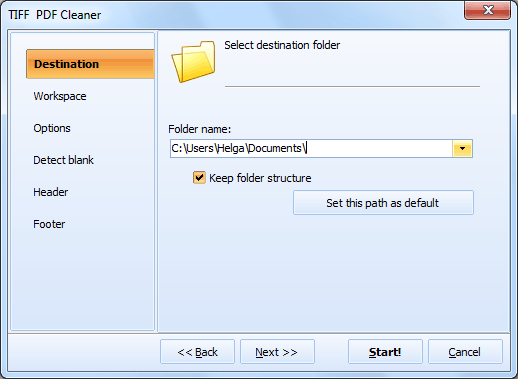 Tiff Pdf Cleaner runs on Windows 2000/2003/Vista/7/8/10 (both GUI and command line versions).